Crowds gathered outside the GPO on Saturday where O'Toole was among the speakers. JOURNALIST FINTAN O’TOOLE has launched his petition for political reform in Ireland with a new website and Twitter account. His petition for reform includes recommending that no one paid from the public purse should earn over €100,000 during the period of the emergency. O’Toole calls for an end to the electoral system that “turns TDs into constituency fixers” and a reduction of the Dáil to 100. That petition can be read in full and signed on his website. He’s racking up followers on Twitter (over 1,300 since Saturday night, and counting), but as yet is only following one person – Miriam O’Callaghan. In fact, he’s proven so popular among Twitter users, that his username “@fotoole” is actually trending in Ireland, according to Trendsmap. Just back from the big demo. It was great to standd up with dignity and reclaim our citizenship. No longer the invisible people? 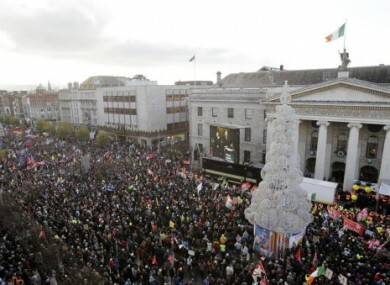 Over 50,000 people attended the protest on Saturday, and O’Toole addressed the crowds on O’Connell Street. He said people had gathered to reclaim their sense of citizenship. Speaking of the government, O’Toole said: “They don’t mind and we don’t matter. Our rulers have no shame and they believe we have no voice”. This is not a rescue plan. It is the longest ransom note in history: do what we tell you and you may, in time get your country back. He described the interest rate being imposed on Ireland as “viciously extortionate”. Email “Fintan O'Toole launches political reform petition online”. Feedback on “Fintan O'Toole launches political reform petition online”.